Kids can strike with confidence as they blast darts designed for accuracy! 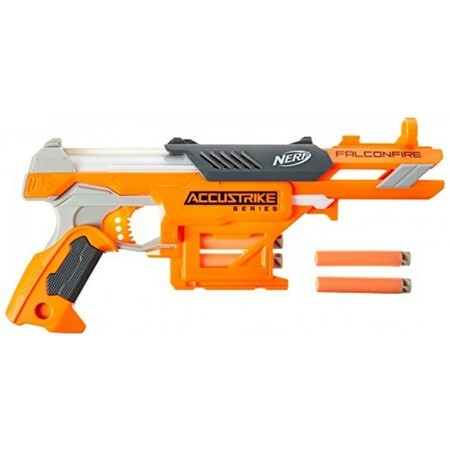 The Nerf N-Strike FalconFire blaster is part of the AccuStrike Series, which features darts designed for greater accuracy. Hit the mark with the precision of the most accurate Nerf Elite darts. Load 1 dart into the top of this single-shot blaster, take aim, and fire! The dart storage area holds darts nearby for easy reloading. Comes with 6 Elite foam darts that are designed for greater accuracy. Compatible with Elite darts (sold separately). Includes blaster, 6 darts, and instructions. Accuracy based on test data comparing precision and repeatability of darts fired under controlled conditions at target 30 feet (9 meters) away. See Nerf.com for details. Ability to hit target will vary depending on user's skill, dart condition, and other factors. We bought a few of these nerf guns as gifts for christmas gifts and donations to toy drives. We were very happy with what we received. Was initially worried they would be a small skimpy gift but that was not the case. Kids had a blast at christmas and price was great for the smiles and priceless playing time for the boys. this was a gift for my son. he has been on a nerf phase where all he has to have is nerf guns. This one he like very well. Very well made and durable. Has not broken yet and he is pretty rough on his toys. Came with some foam gun bullets too. Will purchase again for gift for someone in future. My son loves this gun. It really is an accurate gun. He uses it in "war" to shoot down his army men and it is very accurate. Although one shot, the blaster has a very interesting grip and ironsights, with the circular front iron sight, and it feels very cool. The darts allow more accurate firing than normal. Nerf toys, for the win! Classic Nerf guns are excellent toys because they spark imagination and strategy. Your kids will really love this or other Nerf toys. Especially boys, but even girls seem to like Nerf products, too.